Speaking about the Pandora brand makes people smile – especially the ones from the female crowd. Let’s admit it, their designs are truly marvelous, and their gift with purchase items are not subpar either. We have even featured Pandora’s free wooden music box a few weeks ago, which was their GWP last Valentine’s Day in Hong Kong. 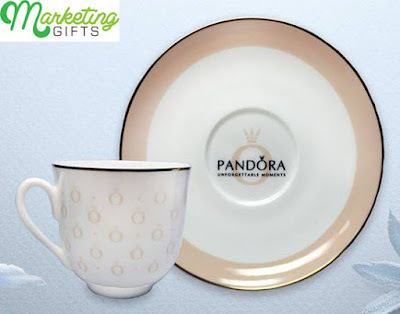 Nevertheless, their stylish promotional ideas do not end with simply beautiful trinkets and jewelry holders, because in Russia, they gave away branded cup and saucer with the brand’s logo and name on them. It draws more deals. The branded cup and saucer are perfect for those who love their coffee or tea time. The pair looks very exquisite too, that’s why they are worthy to be put on display along with someone’s most precious cups and saucers. Whether Pandora’s customers decide to use them or make them a nice spectacle, more sales will still go towards the brand. Brand’s elegance is preserved. Even though they are not encrusted with precious stones, the promo gift items still fit with how the brand is seen by many – elegant and valuable. This is needed in order to preserve the brand’s value. Customer loyalty builds up. Free items as splendid as these make brands become even more wanted by their consumers. Their website often gets visited, which can often end up with more merchandise getting purchased, and more gifts given away. So, the customers’ loyalty to Pandora builds up. Review some of the ways to market your brand at the Marketing Gifts blog.